This pebble set is designed to fit the Legend Heritage gas fire. We all know that a gas fire has many advantages over traditional log and coal fires. For one thing, it burns so much cleaner. It's also easier to maintain. 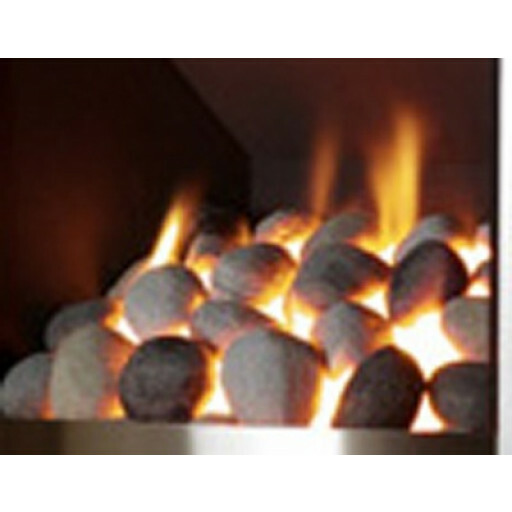 Most of us, however, love the cosy look of burning coals, pebbles or logs. This set-up adds a hint of warmth to your living room. The replacement pebbles for the Legend Heritage gas fire are built from fibres designed to resist high temperatures. They're coloured with dyes used for ceramics, which are totally safe in high heats. These pebbles look great and hold up to the punishing conditions of a gas fire. They'll last for years. Always follow the manufacturer's instructions when it comes to cleaning and maintaining your pebble set. In many cases, even sweeping is discouraged. Any soot that forms can work to insulate the pebbles themselves from the fire. This set includes pebble strips for the front, rear and side of your fire, in addition to the pebbles themselves. It's easy to set up and is highly durable. The pebbles are designed to look great when installed within the Legend Heritage gas fire. This set can be used to revitalise the appearance of your gas fire or simply to replace pebbles that have been used heavily and require replacement. Quick and simple ordering to delivery. Ordered and delivered two days later.